Payne Park is a former baseball field from 1924 to 1990 in Sarasota, Florida. The stadium and field were built on a portion of 60 acres (0.24 km2) of land donated by Calvin Payne and his wife, Martha. Payne Park today is a 29-acre (0.12 km2) public park used for recreational events. The ballpark was erected in 1924 and was a long time spring training and minor league site for baseball clubs such as the Boston Red Sox, Chicago White Sox and the New York Giants. The park ceased its association with professional baseball in 1989 with the construction of Ed Smith Stadium and the ballpark was demolished. Until 1963, the ballpark's dimensions were 375 feet (114 m) down the foul-lines and 500 feet (150 m) to center-field. The ballpark was refurbished on multiple occasions. Prior to Spring Training 1951, the City of Sarasota added 600 permanent bleachers, increasing capacity to just over 4,000. The size of the press-box was doubled as well. Norman Rockwell's 1957 painting The Rookie is set in the Red Sox' spring training locker room, which at the time was located at Payne Park. The White Sox moved their spring training games from Tampa to Sarasota in 1960. Prior to spring training 1963, The City of Sarasota changed the ballpark's dimensions to 352 feet (107 m) down the foul-lines and 415 feet (126 m) to center field to match the White Sox' Comiskey Park dimensions. The Chicago White Sox and Texas Rangers played the last major league spring training game at Payne Park on March 30, 1988. The Sarasota White Sox began play in 1989 at Payne Park. The City of Sarasota reopened the former ballpark-site as Payne Park on October 6, 2007 as a 29-acre (0.12 km2) public park space. The public park was built at a cost of $8.8 million, funded by a county-wide penny surtax. It features a public skateboard park, Frisbee golf course, tracks for walking and riding bikes, lakes and a cafe serving lunches and refreshments. In 2012 the city opened the "circus playground," featuring a small waterpark on site. ^ "Chisox To Find Comiskey-Sized Diamond Feb. 21". Sarasota Journal. 1963-01-17. p. 32. 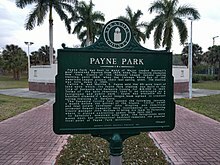 ^ "Payne Park Historical Marker". 2000 Adams Lane, Sarasota, FL: Sarasota History Alive!. Sarasota County Historical Commission. 1996. Retrieved 2018-04-03. ^ "Chisox to Find Comiskey-Sized Diamond Feb. 21". Sarasota Journal. 1963-01-28. p. 32. ^ "Bosox Greeted By A Shiny Payne Park". Sarasota Herald-Tribune. 1951-02-28. p. 1. ^ Anderson, Chris (May 21, 2014). "Who was the rookie in Norman Rockwell's painting?". Sarasota Herald-Tribune. Retrieved December 22, 2016. ^ "Sox Here For Sixth Spring". Sarasota Herald-Tribune. 1965-02-28. p. 2. ^ Hurley, Paul (March 31, 1988). "Sarasota's Payne Park goes the way of the dinosaur". Poughkeepsie Journal. Poughkeepsie, New York. p. 1D. Retrieved November 4, 2018 – via newspapers.com. ^ Sherman, Ed (March 31, 1988). "Williams hurts ankle, may miss opener". Chicago Tribune. p. 56. Retrieved November 4, 2018 – via newspapers.com. This page was last edited on 19 February 2019, at 02:43 (UTC).